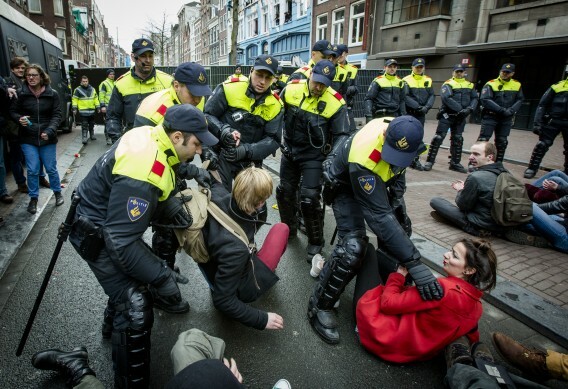 Students in Amsterdam, the Netherlands are protesting and taking quite militant action. We are seeing the most serious student struggles that the Netherlands has experienced for many years. At this moment, a sizable group of students are occupying the Maagdenhuis, the building from where the University of Amsterdam (UvA) is governed. No, I am not one of the occupyers, I am sad to say. I gathered some information, gathered from online sources. The movement started twelve days ago, with a student occupation of the Bungehuis. That is a large university building used bny the Faculty of Humanities. The students, operating under the heading of De Nieuwe Universiteit (The New University), the site of which is mainly in Dutch but contains some English-language texts as well, protested against a reorganization plan, by which several language studies are to be merged, and thorough which fixed jobs would be destroyed. At the same time, students protested against university financing on the basis of how many diploma-holders were produced, and called for financing on the basis of what the education itself costs. And students called for serious democratization of the institution, with elections on all levels, and the possibility of recall through referendum. On the whole it was a protest against both neoliberal and authoritarian management in higher education, a call for democracy on the university. The short version of the demands are on the site of The New University, both in Dutch and in English. The occupation involved at least several dozens of students. After a few days, the number that even mainstream media, for instance, on the website of the newspaper Trouw (in Dutch) mentioned was “about a hundred” . And the occupatiion lasted for eleven days. This was easily the largest and most sustained student occupation in years. The university authorities complained and called for 'dialogue '– on condition that the occupiers stopped their occupation, The thing was: resisting students had called for serious dialogue before the occupation, the whole action got going largely because authorities ignored that request. Students refused to evacuate the building. University authorities then started a legal procedure, and after the first week, a court ordered the students to leave, and imposed a fine of 1,000 euro for every day the students ignored that order. The occupiers ignored the court order, the occupation went on. Day after day, a programme of films and lectures was organised in the building. Academic workers were let in, but work was hindered. Not by the occupation but by university authorities who disconnected the internet and blocked the heating as well. Negotiations between university governors and occupiers – in which the mayor played a role – led to nothing. University regents offered lectures, and a one-yeap postponement of the reorganization plan on Humanities. The occupiers were not having it. Eviction now was imminent. On Tuesday, 24 of February, riot police moved in. They arrested 46 people, and though the eviction looked relatively quiet, outside main stream media's eyes several students were roughed up. One got injured by a police horse's hoof . A few of the arrested activists were released the same day, most had to stay the night in cells and got released the next day. Quickly, a protest march “For Democratic Higher Education” was organized. It spread like wildfire through Facebook, and late this afternoon, "somewhat more than a thousand people” (according to national broadcaster NOS, also in Dutch) took part in the demonstration. This is, for a local student demonstration organized on such short notice, extraordanarily big. There have been national student demonstrations, by the mainstream student groups, that attract crowds that somewhat larger but certainly more sleep-inducing as well. The march was vivid, with a very enthusiastic anger. There were calls to “block and occupy”, calls for the chairperson of the board of regents of the UvA, ironic comments on the “small size” of the number of protesters. The students assembled before the Maagdenhuis, a building of high symbolic significance. In 1969, there was a five day occupation of that building, an action that is considered the high point of sixties student activism. Everytime students start a protest, people say “Maagdenhuis”, usually in a nostalgic, on a wistful tone. There had been later, shorter occupations of the building. Now, a large group of students stood before the building. After speeches, slogans en spirited yells, people forced the entrance. After a short time, a large crowwde moved in. Hours later, under the threat of immediate eviction, students and people in solidarity with them, are seriously discussing what to do. It is unclear what will happen now. What is clear, however, is that a strong student movement against neoliberal management an authoritarian rule on the university has exploded in Amsterdam. And it resonates widely. Occupyers are now calling for a strike, at least among teachers, if I understand the livestream by AT5, a local station correctly. At this moment, the chairperson of the Board of regents – the dismissal of wjhich is now one opf the students' demands – is trying to talk the students out of their occupation. Students are shouting: “Aftreden!”, which means: “Resign!” What happens next is anybody 's guess, but the whole thing is a breath of fresh air. Pictures of the occupation of the Bungehuis, and its evictions, are to be found [url=http://www.vice.com/nl/read/de-ontruiming-van-het-bungehuis-van-binnenuit-712 ] here[/url]. I wrote a number of articles on the rapidly escalating revolt on my Dutch-language website here. There, you can find more sources of information. Touching images of direct and living democracy. We have been driven so far from here in recent decades. Students, you give me hope. Hold on, and thank you! The thing is spreading meeting yesterday, with 200 students fo from many universities, decided to call a national day of action on the universities, coming Wednesday. Plus: lk within union of a university teachers' strike. Sudents stil holding a sit-in in theMaagdenhuis, Amsterdam. No immediate threat of eviction, apparently.